Good morning, and thank you for inviting me to participate in this important event. My role here is to tell the story of this small drawing that is the plan—the artist’s working drawing—for the murals that are being rededicated today. But, being a writer, I feel I can’t proceed without setting the background for that story. My sister Rebecca and I were both undergraduates here in the early ‘70s. A lot has changed since then; in fact, I used to park the motorcycle I commuted on to school in a spot located approximately 100 feet from where I’m standing now. others on the program today who are much better qualified to discuss that topic. But I do want to relate a few personal memories that will help to create a cultural context for the work we’re honoring today. In 1970 the Vietnam War was in its sixth year; the last official American troops wouldn’t leave Vietnam until ‘73. The war and the military draft was a deeply divisive issue on campuses across the nation—especially for young men of a certain age, whose every life decision was still shadowed with the question of what its effect would be on their draft status. San Diego State College was on the lecture circuit for speakers of all political stripes, with Cesar Chavez, Jane Fonda, Angela Davis, Joan Baez, and a 34-year-old California Secretary of State named Jerry Brown all speaking to large crowds in Aztec Bowl during the period. 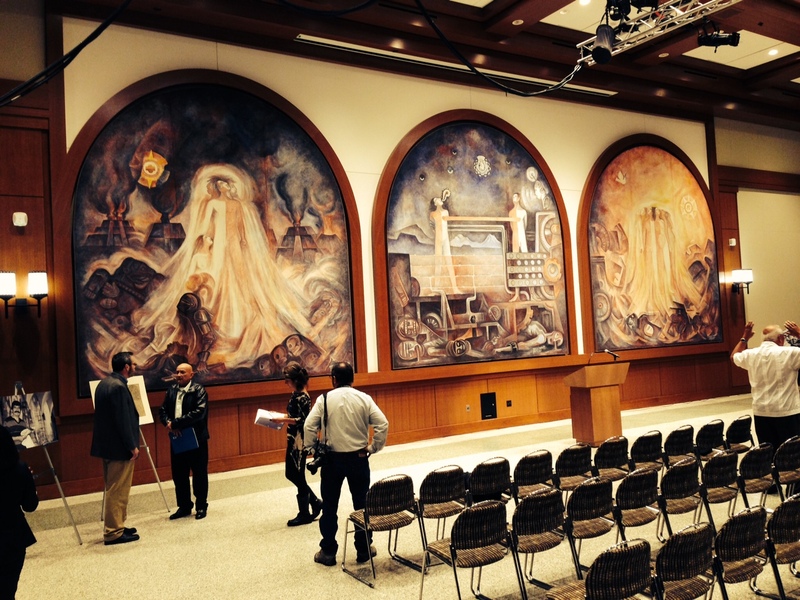 When David Susskind and William F. Buckley Jr. debated each other in Montezuma Hall, the crowd of attendees overflowed to the other meeting rooms in Aztec Center and eventually into the halls and passageways. If I sound as though I miss those days, I guess I do—even though we told each other not to trust anyone over 30 and I’m now more than twice that age. I miss the passion we all felt; the feeling of being involved in social change; the belief in the curative power of protest. After all, it was protest against the war that, in 1968, drove an unpopular president to decide not to seek reelection. But at San Diego State in 1972 it was not all just talk. In April, 75 demonstrators took a number of ROTC students hostage while they were sitting for an exam in the college’s Business Administration and Mathematics building. They were soon released, but the following month 35 protesters (later, some claimed, growing to 2,000) broke into and occupied the Administration building with a “sit-in,” burning copies of the Daily Aztec and setting other fires before eventually moving past the new Love library and across the faculty parking lot (now part of the transit center) to vandalize Aztec center. I remember going into the Administration building on the second or third day of the sit-in just to see for myself what was going on. Students sat on the floor in the hallways, reading, sleeping, or playing cards. A harried employee met me on the second floor and, assuming I was there for some legitimate purpose, apologized for not being able to help me “because…” here indicating the protesters with a sweep of her hand and a shrug of her shoulders. It seemed we were all suffering identity crises, even the school itself. 1972 was the year the college became a university, and the board of trustees designated the school “California State University—San Diego.” But many students, accustomed to referring to their school with the handier “San Diego State” (or, simply, “State”), objected. Each night a contingent of students would rearrange the new campus signs (in an act that was more mischief than vandalism) to read “San Diego State University,” and, in the morning, the campus maintenance department would change them back. As we all know, the SDSU name eventually stuck. And more good news: from the midst of all this tumult and controversy, art emerged—art that didn’t deny or ignore a shameful history or the struggles and violence of the time, but looked forward nevertheless to reconciliation, peace, and rebirth. 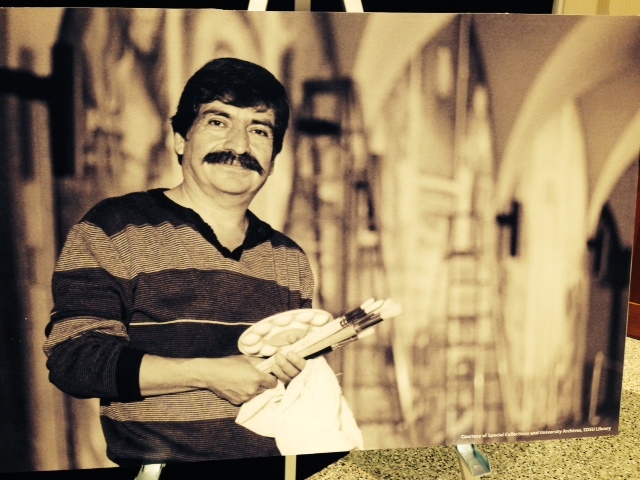 As I said, my sister, Rebecca, and I were students at SDSU during the months that Gilberto was painting his mural. Rebecca was a senior with a major in Mathematics and a minor in Spanish, and visited Aztec Center frequently to admire Gilberto’s work and to practice her Spanish with Gilberto and his assistants.. Rebecca and Gilberto became friends. He came to our family home in Lemon Grove several times for dinner, and Rebecca later visited him when she travelled to Mexico. When he completed his work on the mural, he presented her his working drawing as a gift. I’ve always admired the mural very much. Even today, it’s the central panel I love most, the melancholy one, the one in which the figures’ yearning for connection is palpable, the one in which—flaunting the divisiveness and violence of the time—they send songs of brotherhood to each other across the border. And what I love about the drawing is the way it reveals the underlying geometry of the piece, the care taken with the expressions on the figures’ faces, even the hint of uncertainty it suggests on the part of the artist as to the exact size of the available space. When my sister moved to Colorado for graduate school, she gave the drawing to me. I’ve kept it with me during many moves of my own—to Boston, to Champaign-Urbana Illinois, to New York City, to New Jersey—finally bringing it with me when my husband and I returned to San Diego 40 years later. Perhaps it was my return to San Diego—and to the University, as an extension student—that made me realize that the drawing belongs here, alongside it’s full size realization. Unfortunately, my sister is not able to be here; she passed away in 2012. 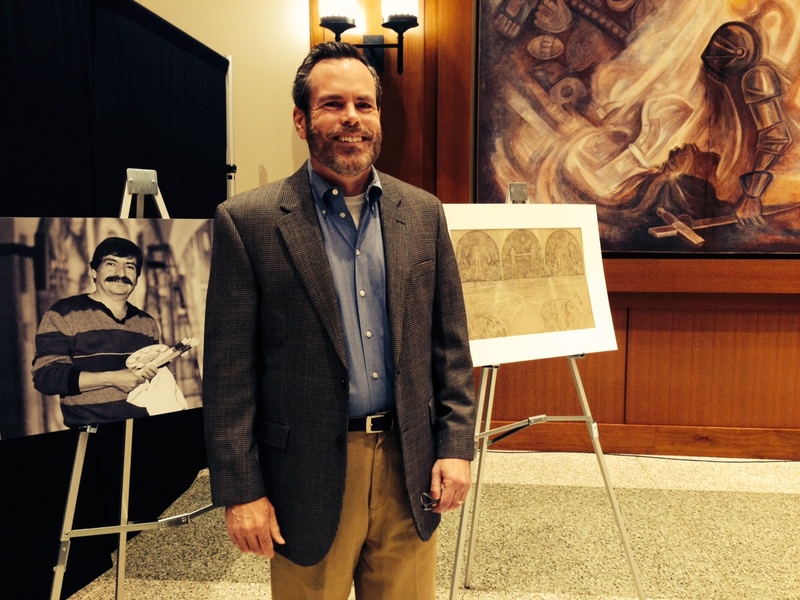 But I know that she would have been as thrilled as I am to see Gilberto’s drawing and mural reunited. Thank you again for inviting me, and for giving me a chance to tell this story.